Immediately before joining the court, Justice Kruger served in the United States Department of Justice as a Deputy Assistant Attorney General for the Office of Legal Counsel. From 2007 to 2013, she served in the Department as an Assistant to the Solicitor General and as Acting Deputy Solicitor General. During her tenure in the Office of the Solicitor General, she argued 12 cases in the United States Supreme Court on behalf of the federal government. In 2013 and in 2014, she received the Attorney General’s Award for Exceptional Service, the Department’s highest award for employee performance. Justice Kruger had previously been in private practice, where she specialized in appellate and Supreme Court litigation, and taught as a visiting assistant professor at the University of Chicago Law School. A native of the Los Angeles area, Justice Kruger attended high school in Pasadena. She received her bachelor’s degree with high honors from Harvard College, where she was elected to Phi Beta Kappa. She received her J.D. from Yale Law School, where she served as Editor-in-Chief of the Yale Law Journal. 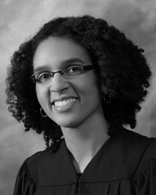 Following graduation, she served as a law clerk to Judge David S. Tatel of the United States Court of Appeals for the D.C. Circuit, and to Justice John Paul Stevens of the United States Supreme Court.